Legend Mobile Game continues to get a lot of new hero characters, which after presenting the Gatotkaca hero tank a few weeks ago, now the game will also soon the arrival of a new tank hero called Grock. Game MOBA (Multiplayer Online Battle Arena) is indeed loved by many mobile gamers, both domestically and mancanegera. 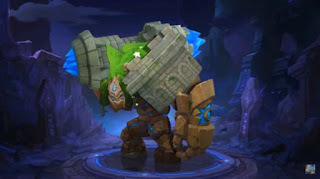 For the Mobile Legend gamers would already know the news of the presence of this new tank hero, because Mobile Legend fanpage page on Facebook has leaked information about Grock. Even Moonton has also released a video trailer on YouTube that reveals the form of the new hero. Because entering the tank category, reasonable when the form of the character of this game is very large. Grock also has the nickname The Fortless Titan which means impregnable fortress. Grock’s costume also shows the existence of a castle and his body is hard as a rock. Of course this will further enliven the hero category of tanks, after the legend of Indonesia, Gatotkaca presented in the game as “muscle wire bone iron”. Unfortunately, Grock is currently not present on the local server, and is only available on some advanced servers only. YouTuber Blue Panda who has been uploading videos on Mobile Legend tips and tricks is also seen already using this new hero. That way, the other gamers can know the skills possessed by this one hero. As revealed by Blue Panda, Grock’s passive skills are quite interesting where he will get a shield when it is adjacent to his own turret. For all three special skills, Grock has Power of Nature skill, Guardian’s Barrier, and Wild Charge. For the first skill or Power of Nature, Grock will spin around to attack any nearby enemy and reduce the enemy’s movement speed for two seconds. The second skill or Guardian’s Barries will fire a shock wave that can result in physical damage of 300 (+71) to the enemy. While the ultimate skill or Wild Charge will make Grock attack by plowing forward to produce physical damage 300 (+71). Next post Not Perfect, Wireless Charging On iPhone 8 Still Slow?